"WE WARN that individuals who violate covenants of chastity, who abuse spouse or offspring, or who fail to fulfill family responsibilities will one day stand accountable before God. Further, we warn that the disintegration of the family will bring upon individuals, communities, and nations the calamities foretold by ancient and modern prophets." I'm not a master strategist. I haven't received any kind of training on warfare or how to defeat an enemy. I have never been in combat, been shot at, or shot at anyone. I have spent a ridiculous amount of time playing strategy games on the computer and board games like Risk, Monopoly, and chess. When I play these games, and I'm pretty good at them, my tactics develop and change as the game progresses. Sometimes I may attack directly and throw everything I have at my opponent. Other times I will hang back and watch to see what unfolds. But regardless of my tactics my overall strategy is the same: to weaken my opponent's ability to fight back. I want to undermine them. I want to cripple their productive capacity. 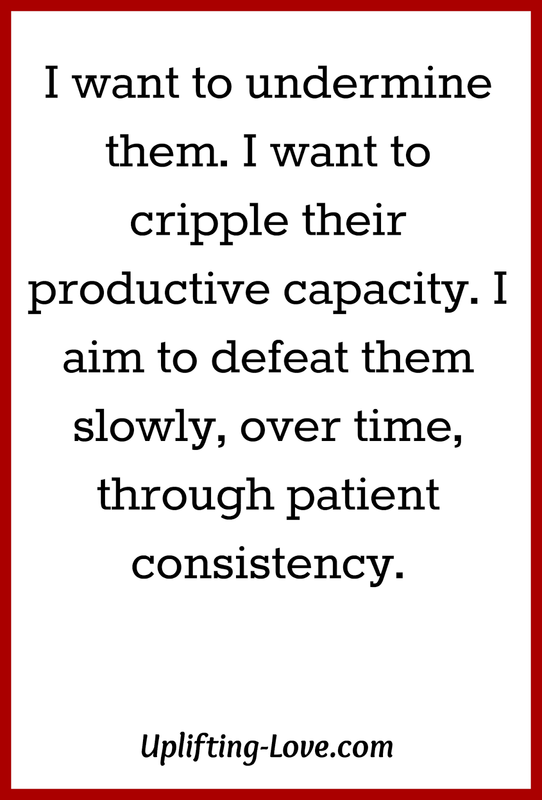 I aim to defeat them slowly, over time, through patient consistency. Let me share an example from Risk. In Risk when you control a continent you receive extra reinforcements each turn. I like to hold just one or two territories in the continent that my opponent is trying to conquer to prevent that. If I can do that and control a continent of my own then each turn I am becoming stronger while he (or she, but I've found that girls don't like playing Risk) weakens in comparison. In Monopoly you grab one of the properties, like one of the four railroads, and just hold on to it. It keeps the other players from building houses and hotels and keeps your rent down when you land on their properties. Slowly but surely, if you can control an entire set or two, you wear them down. Does this strategy always assure me the victory? No. But it always makes me a force to be reckoned with. How is this related to families and marriage? In Risk, if you want to be strong and win the game you need to control continents. In Monopoly if you want to be rich and win the game you need to control sets of properties. In marriage and in family if you want to be happy and successful, if you want to win at life, you need to have the right strategy. What should your strategy be? I propose something simple, actually several small and simple things. Why should we have a strategy? Because it is the small and simple things that we do that really strengthen and solidify our marriages and our families and when they are consistently applied great things come to pass. Have faith. Pray both privately and as a couple and as a family at least daily. Repent by asking forgiveness for wrongs and mistakes you have committed and strive not to repeat them. Forgive by allowing others the gift that you seek when you repent. Show respect to those you love most. Love them unconditionally both in word and in deed. Feel compassion for what they struggle with as well as for the things at which they succeed. Work hard. Then play hard through wholesome recreational activities. This is the strategy I recommend. This is the strategy that Cami and I use. The tactics will vary (Cami and I enjoy miniature golf, you may not so you can go bowling instead) from marriage to marriage and family to family. They will also vary from year to year. Our children love the park right now. When they're teenagers I don't think they'll feel the same enthusiasm. The tactics vary and change. The strategy is the same. Let's stave off the disintegration of the family, in fact, let's reverse the tide all together. A key to winning in marriage and in our families, to winning in life, is strategy. What's your strategy? We have had to say, no looking back at what might have been, and no regrets for going forward. I like all your nine principles and we have used them all during our Looonngg marriage. Thank you for sharing your inspiring post with us here at “Tell Me a Story." So true. 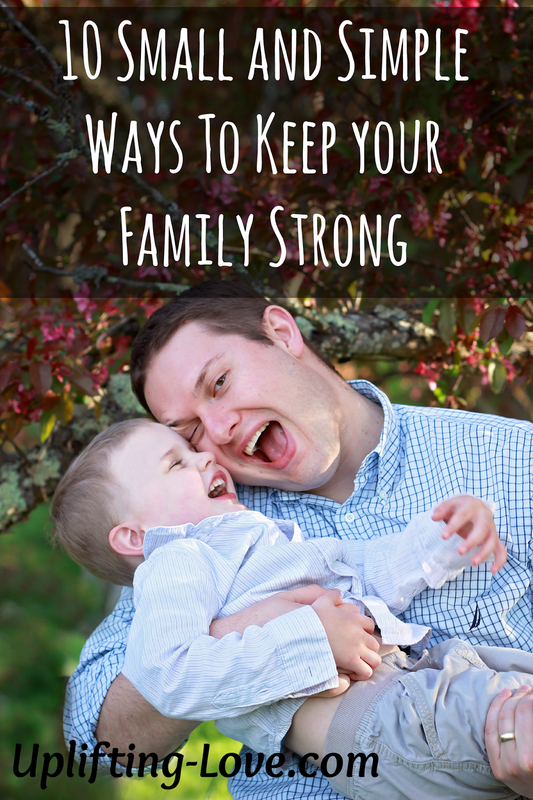 We need to strengthen our families from the inside out. Build up our walls to strengthen from the negative influences of the world, media, etc. Marriage is sacred. Family is integral to our progress. I agree - we do have to have a strategy and fortify ourselves with God's armor so that we can withstand the attacks the enemy throws at us. When we strategize about how to love better and be intentional, that love becomes a force to be reckoned with as well. Well put Jen! Thank you for sharing! I agree. The disintegration of the family causes much heart ache & irreparable damage that much of it is left untold...buried in people's grieving hearts & minds. Seen it first hand in my parents' marriage...in many of my friends' lives, etc. etc. Thanks for the inspiring reminder to hold on & keep fighting!